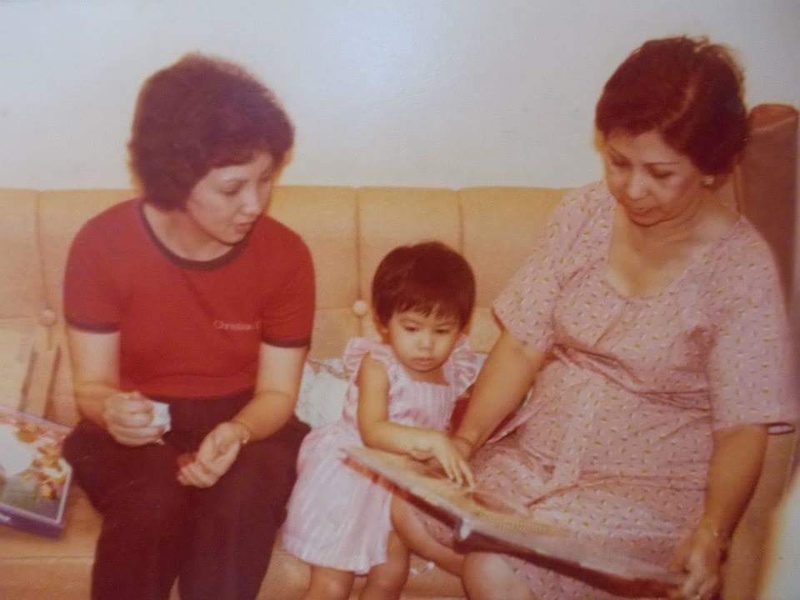 My mom, me at two-years-old, and Ninang Azon. A few weeks ago, it was my godmother's twenty-fifth death anniversary. I remembered that I wrote a tribute to her a long time ago. I searched for that piece of paper among my old things in my parents' house. I brought that weathered typewritten sheet back to Cebu and decided to post it on my blog as a way of keeping her memory alive. It has been sixteen years since I wrote it and it seems just yesterday when I was hunched over my desk trying to keep the tears from rolling down my face as I recalled all the wonderful experiences that I had with her. On March 4, 1993, my godmother, Corazon, died of cancer. She was only fifty-eight years old and during her funeral, all of her friends and relatives came to say their last respects to a woman who had endured the fear of facing death. My Ninang Azon had learned of her sickness five years earlier and since then, she regularly received chemotherapy treatment. Every time she goes to the hospital, all of us feel the pain that she experience because we all loved and respected her. I remember when I was younger, I would usually spend a portion of my summer vacations at her house. I was always greeted with a warm smile and gentle appearance. During my visits there, I learned to appreciate books because she had a wide collection of reading materials. Through her, I met Napoleon Bonaparte, Jonathan Livingston Seagull, Oliver Cromwell, King Tut among others. Whenever it's my birthday, she would bake me my favorite cake. For my first birthday celebration, she was the one who made my amazing doll-cake. She comes to my mind whenever I see orchids. It was a passion of hers growing orchids. Every afternoon, she would go to her garden and tend to her plants. She would water them and cut away the dead leaves. There were occasions when she would pick me up after school and I would spend the afternoons with her. My mom considers Ninang Azon her best friend. They could spend hours talking on the phone. My mom would often visit with her and stay until late in the evening. One thing about my Ninang Azon was that she never forgot important things. She remembered her relatives' and friends' birthdays by heart. I never saw her get angry. She had a positive outlook on life and it shows in her manner. Every time there was a gathering, she was always the center of attention because of her stories and anecdotes. She was an intellectual because of her love for reading. She was full of life and there was never a dull moment with her. When we learned that she had the Big C, all of us cried and thought of what would happen if Ninang Azon was no longer there. We felt an emptiness when we saw her lying inside the casket. She was beautiful as ever and looked peaceful and contented with her life. Even though she felt pain during her last moments because of difficulty in breathing, she still had that look of determination. She was truly a courageous person. She never gave up until the last minute. It has been eight years since she died and we still often remember her. Sometimes, whenever my mom and her daughters would be talking about interior decoration or party decorations; they would often let out a collective sigh and say that Ninang Azon would have enjoyed doing those things as well. Once in awhile, I would think of her when I would come across the book titles that I had borrowed from her. I would like her to know that my passion for reading was the greatest gift that I have received from her.